Understand your unique nutritional needs. Import your genetic data from AncestryDNA or 23andMe, complete the Habit test kit, and receive your personalized nutrition plan based on your results. 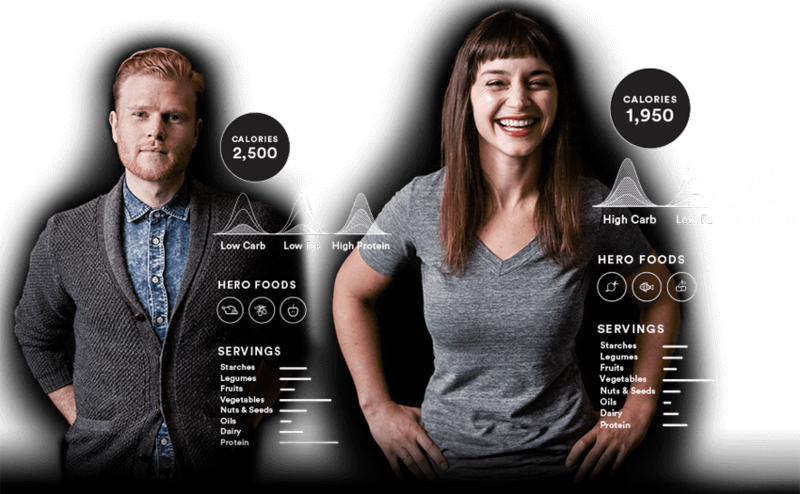 The Habit kit tests your metabolism, DNA and body metrics. If you already have DNA results from 23andMe or AncestryDNA, we won’t need to retest your DNA and you can save $100. We accept HSA/FSA payments. Check your plan for coverage as individual plans will vary. *Currently not available in NY, NJ, and RI. Habit is not available for sale outside of the United States. "I am giving my body the right foods and the nutrients that it needs. For me, it's not just about size, it's about being healthier." "It puts my specific protein, carb, fats, and vegetables into perspective... my perspective was way off before I had my results." How are Habit's results different from my AncestryDNA or 23andMe results? Habit's results also include your blood test results, including how your body responds to the carbs, fat, and protein in the Habit Challenge® Shake. Your results are the foundation for your personalized nutrition plan, which is based on a holistic analysis of you: your blood indicators, genetic variants, lifestyle factors, and goals. By connecting the dots between these different factors, we can provide you with the most precise nutrition recommendations. Your nutrition plan also translates your results into real foods: what your ideal plate looks like, the food groups you should aim for in a day, and which foods are especially nourishing for you. Our recommendations aren't based on DNA alone, because your genes don't determine your destiny. For instance, having a genetic variant that has been reported to be associated with a higher-than-normal triglyceride level doesn't mean that you'll definitely have high triglycerides. Genetics is only one of the factors that influence your health. To get a more complete understanding of your biology, we analyze your blood work, lifestyle factors, and your body's response to the Habit Challenge® Shake. Do you import all of my genetic data from AncestryDNA or 23andMe? No, we don't import all of your genetic data. When we create your results and nutrition plan, we look at only your relevant wellness-related genetic data. This includes any genetic variants that could have an impact on your Habit nutrition recommendations. How do you use my genetic data? We use your biomarker information (including your genetic data) to provide you with nutrition recommendations, customize your user experience, and enhance our services. Also note that the information you see on Habit is not medical advice, and Habit services are not intended to be used in the diagnosis, cure, treatment, mitigation, or prevention of any disease or other medical condition or impairment. If you have questions about your health, please direct them to your doctor or other health care provider. Will my nutrition plan be different if I use my AncestryDNA or 23andMe data instead of your DNA kit? No, your nutrition plan and recommendations will be just as comprehensive as someone who completes a DNA test as part of Habit Core. Can I use my HSA or FSA account to pay for the Habit Core kit? It may be possible to pay for Habit Core with your health savings account (HSA) or health flexible spending account (FSA). Check your plan for coverage as individual plans will vary. Are Habit tests covered by insurance? Contact your insurance provider to discuss coverage. At-homes tests, like the Habit Nutrition Test included in Habit Core, are not typically covered by insurance. They may, however, be paid for with an HSA or FSA account. See Can I use my HSA or FSA account to pay for a test? Simple, illustrated guide and app walk you through the test. Proprietary, clinically-validated Habit Challenge® Shake with the caloric and macronutrient equivalent of a large breakfast meal. Pre-labeled, postage-paid mailer for sending your samples to the lab. Samples processed by a CLIA certified and CAP accredited laboratory – Aegis Science Corporation. Developed with Dr. Leroy Hood, MD, PhD and Dr. Ben Van Ommen, PhD, world-renowned scientists and leaders in systems biology. 530+ scientific references have been used in the creation of our recommendation system. 11,000+ hours have been spent designing recommendation decision trees and ensuring they&apos;re based on solid scientific evidence. *The Habit program is a nutrition and diet recommendation platform. Information available through Habit does not constitute medical advice, the Habit services are not intended to be used for any diagnostic purpose and are not a substitute for professional medical advice. The nutrition biology report contains nutrition-related blood and genetic results that are used to create nutrition and diet recommendations, coaching, and other nutrition products tailored to your personal health, needs, and goals. Enter your goal and we&apos;ll instantly adjust your plan so you can meet it. Access your plan securely on the web or on-the-go with the Habit app. *Disclaimer: Habit does not guarantee weight loss results and results will vary. Weight loss with Habit is designed for no more than 1-2 pounds per week as part of a calorie-controlled diet and will depend on your individual goals. Habit takes a comprehensive approach to weight loss that includes biology-based nutrition recommendations, digital tools like food journaling, activity tracking with FitBit®, community support, digital meal plans, recipes and goal tracking.